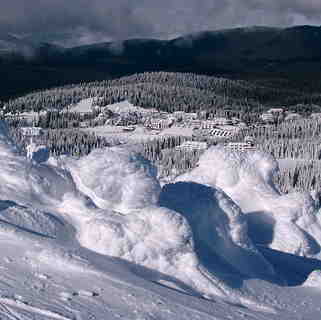 Is it snowing in Kopaonik ?¡Gracias! Heavy rain (totál 26.0mm), heaviest durante la tarde de sábado. Very mild (max 16°C el viernes por la tarde, min 2°C el domingo por la mañana). Wind will be generally light. Heavy rain (totál 30.0mm), heaviest durante la tarde de lunes. Mild temperatures (max 7°C el lunes por la tarde, min 3°C el lunes por la noche). Wind will be generally light. La tabla anterior muestra el pronóstico de tiempo para Kopaonik en la altitud específica de 1536 m. Nuestros modelos meteorológicos sofisticados permiten prever pronósticos para la cumbre, la mitad y la base de Kopaonik. Para aceder a los pronósticos de tiempo a otras alturas, pinche en la navegación en la parte superior de la tabla. Para una visión general, consulte el Mapa meteorológico de Serbia. One of our best ski holidays to date! 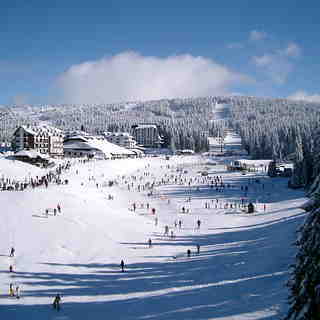 I organised a 3 day ski trip in Kopaonik for a group of 12 friends aged 22-26. We stayed at chalet Montana which can also be rented out by room. It was a beautiful chalet run by 2 friendly brothers. The price was fantastic and included breakfast and dinner (montana.rs). The accommodation in the centre isn't very pretty so we preferred this option. It took 5-10mins in a taxi to get to the centre of the resort and cost £1 a day each in taxi costs. There's also a range of spas within walking distance, great after a hard day's ski. There's about 60km of piste which was perfect for 3 days. Beginner/intermediates would be fine for a week. The food and restaurants on the mountain were so cheap; lift pass (15euro/day ) and ski hire (£5/day) was an absolute bargain. The resort is 4/5hrs from Belgrade. We decided to spend one day/night in Belgrade before transferring. The nightlife was brilliant and the transfer the next day was not bad at all. We organised a private transfer through taxido.net which came to £35rtn each. I cannot recommend this resort and chalet anymore. We loved it. It was brilliant to sample somewhere other than the typical French, Swiss resorts etc. Our whole trip, including flights etc, came to £250. Amazing.